Happy Easter! Hop on over for some fun, easy to use speech and language activities. 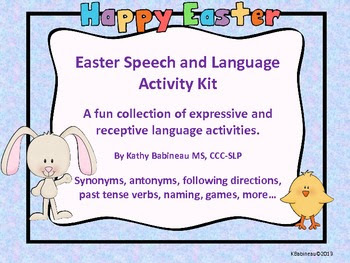 These Easter-themed cards,games and activities can be used in 1:1 and small group speech/language lessons. They are also great for classroom centers and ELA groups. *Mini Jelly Beans and Basket Collection Mat for game playing and motivation!